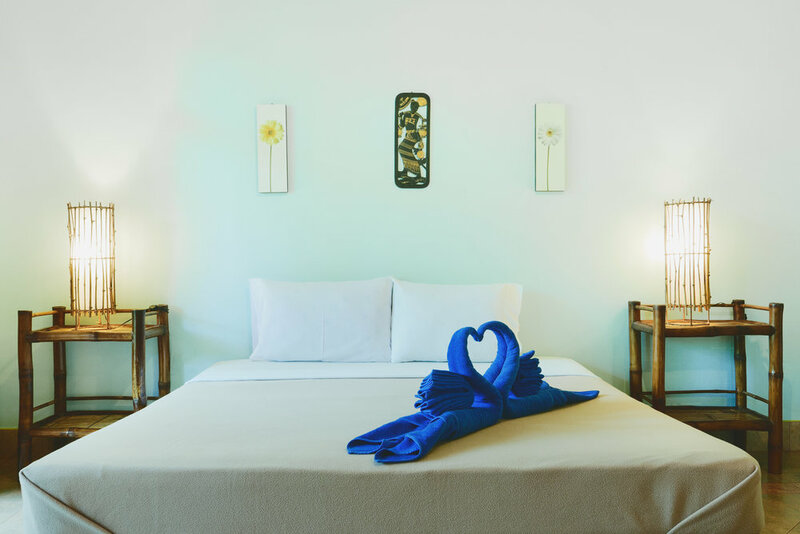 All our rooms (fan and airconditioning) come with hot and cold water shower, private bathroom and either a queen size (6 foot) or two separate beds. 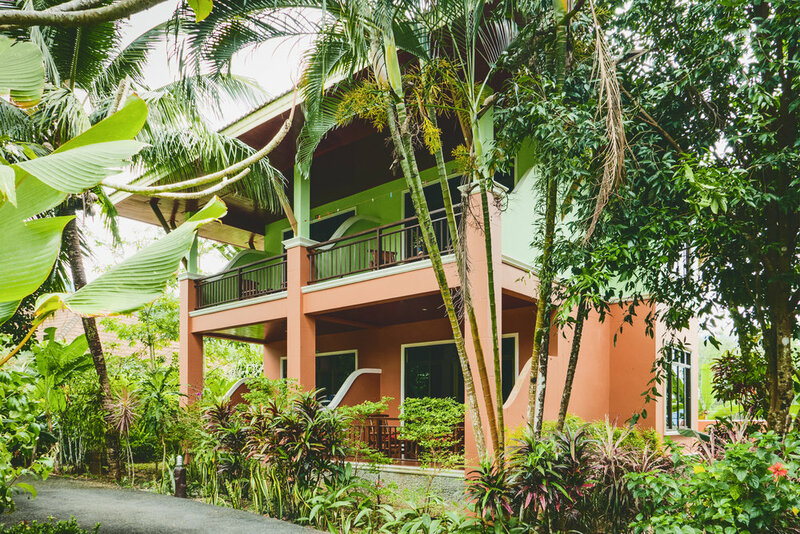 The bungalows are located at the back of our restaurant - set in a peaceful, nice and quiet garden away from the main road and noise. The FAN ROOM has an area of roughly 35 square meters. Each room in this category is available with - you guessed it - a fan, a separate bathroom with a hot water shower, a small variety of bamboo furniture, several 220 volt outlets (compatible to european plugs) to charge and power your electronic devices and a cleaning service that will also provide you with fresh towels every 2 days. For guests who want to have more facilities we offer the SPECIAL FAN ROOM*. This room comes with a large living/sleeping area and a kitchen in the back. The kitchen comes with a large fridge and cupboards to store your equipment. It is a nice room if you like to stay for a long time (ask for our special long term prices). The AIR CON ROOM has an area of roughly 48 square meters. Each room in this category is available with an air condition and an additional fan. We also provide you with a mini fridge to store your groceries and beverages. 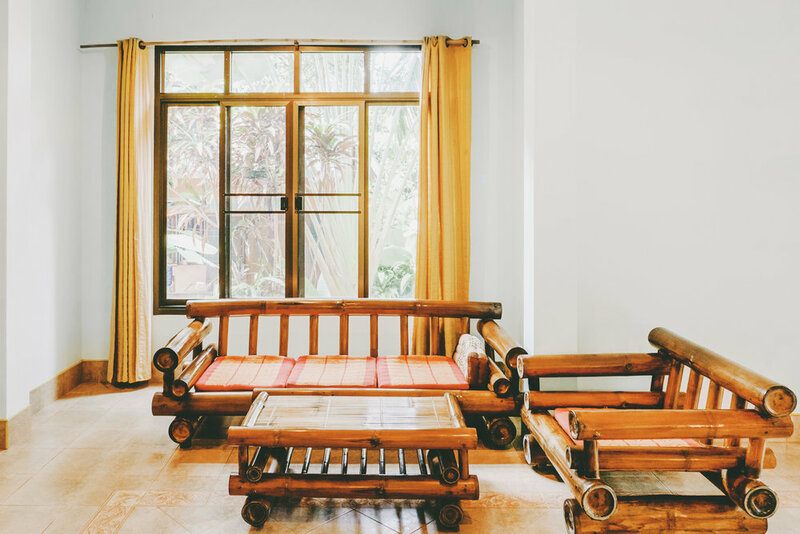 Furthermore you have a separate seating area made of bamboo furniture, a bathroom with a hot water shower, several 220 volt outlets (compatible to european plugs) to charge and power your electronic devices and a daily cleaning service. The SPECIAL AIR CON ROOM* has a roof terrace and a large living/sleeping area. The room comes with a separate bathroom with hot water and a mini fridge. Very nice room for guests who want to have more privacy !